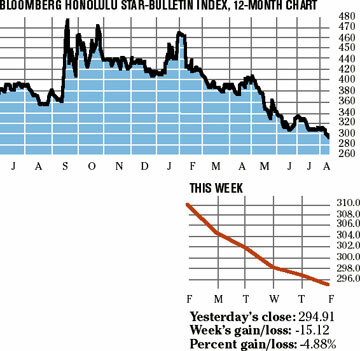 Hawaiian Airlines' parent, which posted a $9 million operating profit in the second quarter, was the only company this week to post a gain in the Bloomberg Honolulu Star-Bulletin index. Hawaiian Holdings Inc. gained 3 percent to close yesterday at $3.45. 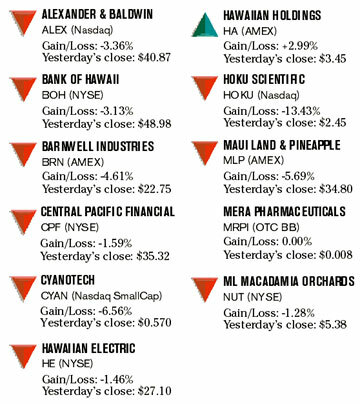 Hoku Scientific Inc., a Kapolei-based developer of fuel-cell technology, continued its slide as it dropped 13.4 percent to a new low of $2.45. Cyanotech Corp., which said this week it was delaying its fiscal first-quarter earnings report until Aug. 21, fell 6.6 percent to 57 cents.